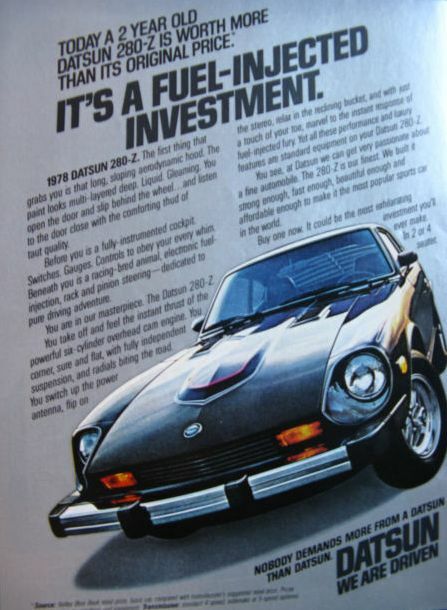 Outlined below is a brief history of the Datsun 280Z in respects primarily to United States marketing and production. You will also find a basic review of features, specs and models. The Datsun 280Z is part of the Nissan S30 lineup known as the Fairlady Z in Japan. Prior to the 280Z Nissan produced the 240Z from 1970 to 1973 and the 260Z in 1974 for US markets. The Datsun 280Z was a US only nameplate when introduced in 1975 while the 260Z continued to be produced for other markets through 1978. A part of the reason for this was due to the United States changes to the automotive industry manufacturing standards surrounding pollution and safety. Because of this the 280Z was modified design wise several times during the short four year run to meet evolving United States emission and safety requirements. This included a crash bumper that protruded from the body for model years 1975 and 1976 that was later redesigned to be more incorporated into the lines of the 280Z for 1977 and 1978. Additionally in response to the need for greater fuel economy and performance a larger gas tank was added for 1977 displacing the full size spare for a smaller space saver design. The larger fuel tank was also coupled with the option for a 5 speed manual transmission which also came with a “5-speed” emblem on the rear hatch. Despite varying popularity both the standard two seat coupe body style and 2+2 hatchback were produced during the entire production run. Listed below are the major specs and features for the stock Nissan Datsun 280Z. The stock 280Z engine is a cast-iron block with alloy heads including a seven bearing crankshaft and single overhead camshaft. The fuel system for the L28E was deliver via an electric fuel pump; the dependable Bosch L-Jetronic fuel injection system. Many owners of 240Z and 260Z model Datsun cars who want more power opt to drop in a 280Z L28E engine as the swap is somewhat seemliness and interchangeable. The following were special edition Datsun 280Z models. Although commonly confused the 280Z and the 280ZX are actually two entirely separate vehicles on completely different platforms / chassis. 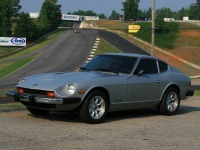 The Datsun 280ZX (Nissan S130) actually replaced the Datsun 280Z (Nissan S30) in 1978 and run through model year 1983. The 280ZX can be distinguished by its longer lines, as it is a 3-dr fastback.